Increasing fuel costs and tougher emissions standards means you need a solution that is leaner and greener, while still maintaining the highest levels of operational productivity. The Kalmar Eco Reachstacker provides you with an eco-efficient solution that is guaranteed to use significantly less fuel than other reachstackers. Cutting your costs and reducing your emissions while enhancing your environmental reputation. In comparison to older machines, our eco-efficient solution can reduce your fuel consumption by up to 40%, and by up to 25% compared to more recent machines, cutting your fuel costs and emissions while matching the productivity levels of machines with much larger engines. Knowing exactly what your fuel costs are going to be each month gives you a greater level of financial predictability, which is why Kalmar is offering a Fuel Saving Guarantee with each of its Eco Reachstackers. With an agreed and fixed level of fuel consumption, based on a set of agreed metrics on your cargo handling drive cycle, you’ll have complete control over your fuel costs. Our Fuel Saving Guarantee also includes driver training, and your machine will be connected to Kalmar Insight, a versatile fleet performance management tool for cargo handling operations. Improving the working environment and safety of your drivers is extremely important, as it will improve their productivity and reduce accidents. With our enhanced driving experience your operators will feel more in control with smoother acceleration and safer with less cabin noise and emissions. More responsive braking and steering systems, combined with improved joystick control, will together speed up spreader operations. Quicker and safer to service. We know that maintaining high levels of availability is important to you, which is why we have focused on speeding up regular service tasks. You can now take quicker oil samples, get easier access to transmission electrics and your transmission is faster to service as itcan be calibrated at higher temperatures. Kalmar Lifetime Services ensures that your operations work at an optimal level with a high degree of financial predictability. Our dedicated service teams, in over 100 countries, will help support and maintain your business. With us you get a committed partner who is focused on your equipment availability and realising the full value of your investment. Reduce fuel consumption by up to 40%. Reducing your fuel consumption means that you also reduce your emissions by the same amount. In the case of an older machine you will reduce your emissions by up to 40% and 25% when compared to a newer reachstacker. With substantially less emissions than other reachstackers, this new solution will help make your operations greener, eco-efficient and safer. With smoother acceleration, more responsive braking, improved steering and a new joystick your operators will feel more in control and be able to operate their new reachstacker safely. You will benefit from easier and safer access to servicing points, which will speed up daily service checks and keep your operator safe. Kalmar Academy offers a range of driving and technical courses so your operators can get the best out of your new Eco Reachstacker. Included with the Fuel Saving Guarantee is full driver training which will focus on teaching your operators how to get the best out of your new reachstacker eco-efficiently. Optimise your reachstacker with Kalmar Insight. 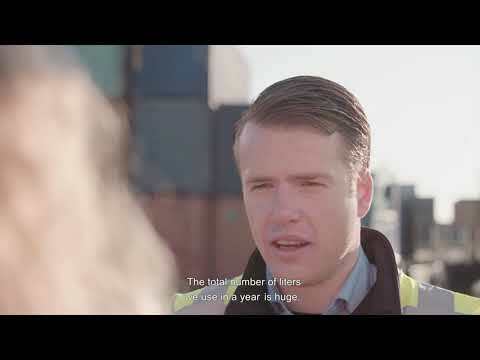 Kalmar Insight is a performance management tool for cargo and material handling, which gives you a valuable and easy to use overview of your daily operations based on equipment status and performance. Making it quicker for you to act on relevant information that will help you improve your operations, your equipment’s performance and your business. Kalmar Insight* comes fitted in all new Kalmar machines and can be retrofitted to existing Kalmar machines or those built by other manufacturers. Kalmar Insight is included when the Eco Reachstacker is chosen with a Fuel Savings Guarantee. * Installation costs and or an annual subscription fee may apply. SOLAS compliant load measurement system. You can have your Eco Reachstacker fitted with the Kalmar Load Measurement System, which records the precise weight of every load your machine handles and records this information automatically in Kalmar Insight. This system is SOLAS compliant and can also be fitted to most reachstackers.